Maximum size: about 65 mm (Kay & Young, 1969). Identification: This species has an oval body and a low profile, with a mantle that completely overhangs the sides of the body and the foot. The dorsum ranges from red to yellow with numerous small, white spots and ocelli. The mantle is margined in yellow, dark blue and light blue, but in some animals the dark and light blue are reversed. The foot is bright yellow or yellow-orange. Natural history: Goniobranchus albopunctatus is a rare species found on rocky bottoms. It occurs in highly protected to moderately protected locations, sometimes under silty conditions, at depths of 3-20 m (10-65 ft). It's diurnally active. A 39 mm animal laid a peach-colored egg mass 20 mm in diameter with 3 1/2 whorls. Distribution: Big Island, Maui, Molokai and Oahu: widely distributed in the Indo-Pacific. Taxonomic notes: This species was listed as Chromodoris imperialis (Pease, 1860) in Kay, 1979 as well as Kay & Young, 1969. It was also listed as Chromodoris cf. imperialis (Pease, 1860) in Bertsch and Johnson, 1981. It was named for the white spots covering the notum. 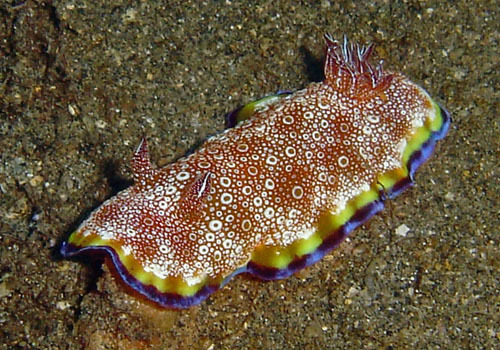 It's listed as Chromodoris albopunctata and referred to as the "white-spotted nudibranch" in Hoover, 1998 & 2006. It was first recorded in Hawaii from Ala Moana, Oahu in Dec., 1964 (Kay & Young, 1969). The earlier attribution to Pease in Kay, 1979 applies to Hypselodoris imperialis, instead. Photo: PF: St. Anthony wreck, off Kihei, Maui; May 29, 2013.